About three weeks ago I made the decision to drop my running down from six days a week to five because my calves were bothering me so much. I thought the extra rest day might give them some reprieve, but to be honest, I don’t think it really helped much. However, I am enjoying the extra rest day! Even though I’ve run six days a week since 2013, I’m not used to standing all day working on the house on Saturdays/Sundays. Since I’m not getting that extra rest it feels right to take an extra day off from running for recovery purposes. Yesterday was a non-running day so I thought we could chat about some random things! 1. I decorated my office for Christmas! 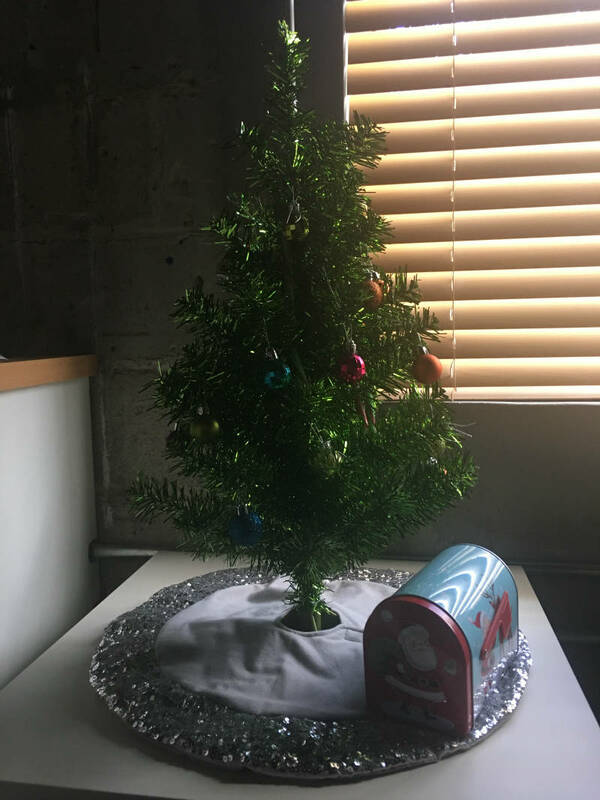 I bought my mini Christmas tree, skirt and ornaments five years ago for like $25 total and it’s still going strong. 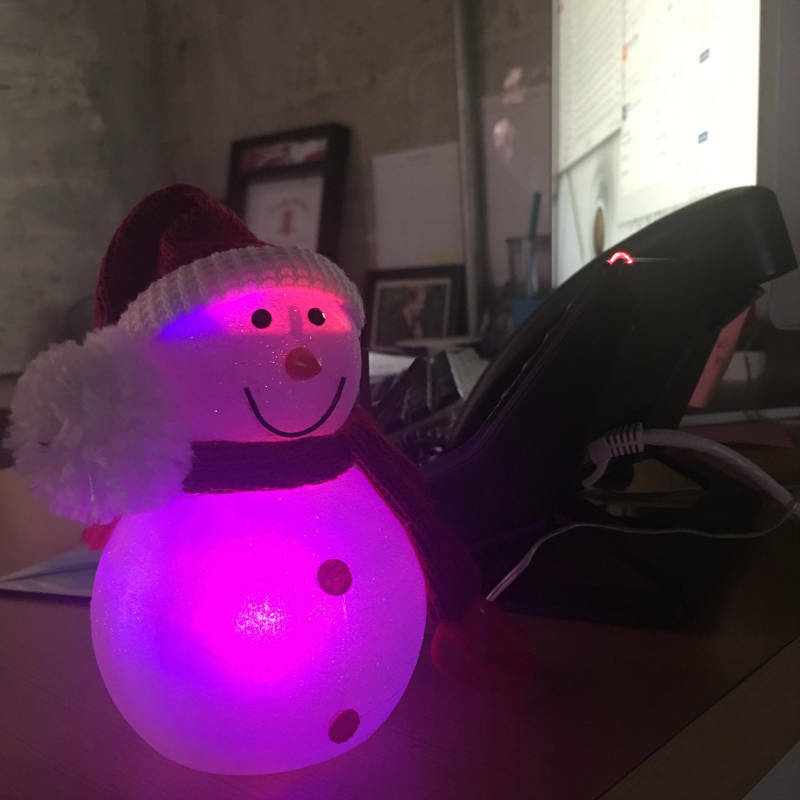 Cecil the Snowman is a new addition to my desk this year. He lights up different colors, so cute! 2. I have a new favorite nail polish color! After spending so many hours painting the house recently I thought it was only fitting that I should take a few minutes to paint my nails. 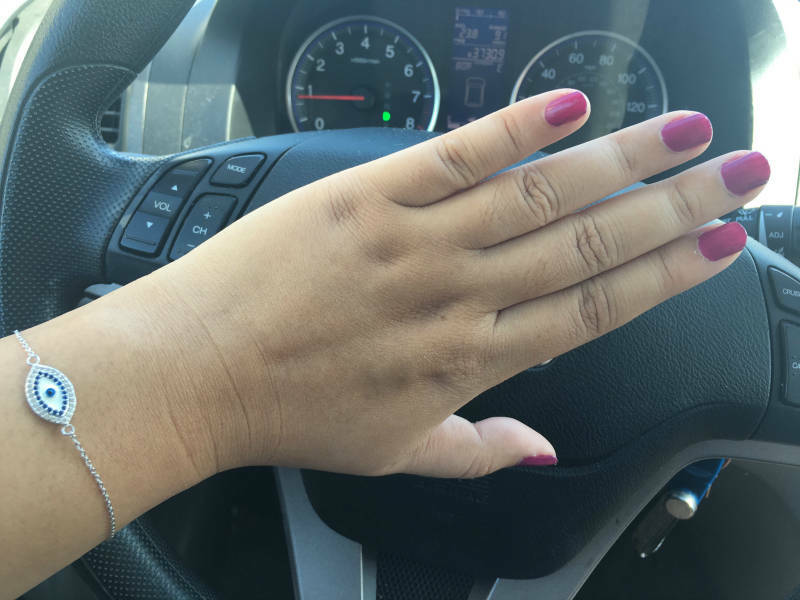 I bought this pretty Cherry Fast color from Sally Hansen Insta-Dri (my favorite nail polish line because I have no patience for waiting for polish to dry). ^ Photo taken during the loooooooongest railroad crossing stop ever. I think I was stuck there for a good 15 minutes! 3. New welcome mat is down at the house! 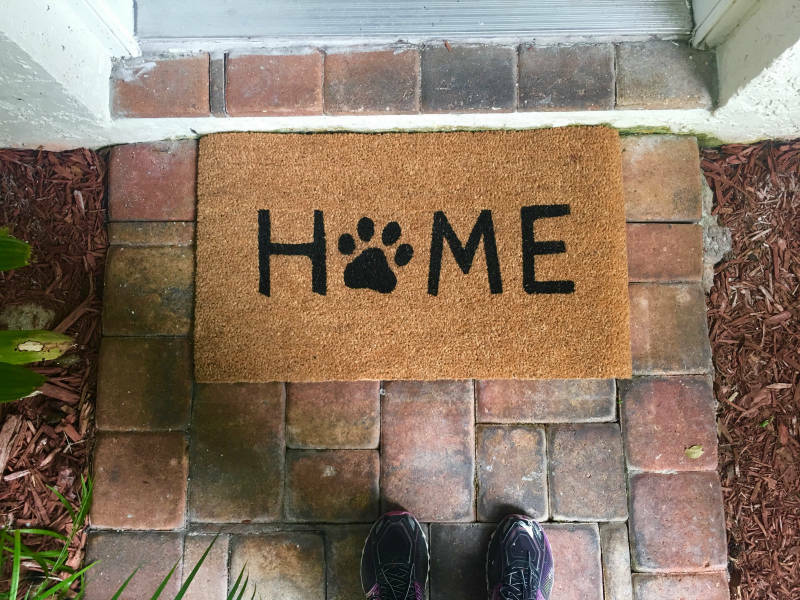 Last Saturday I finally unrolled the new welcome mat and put it on the front doorstep. Less than two weeks until we can officially call it home. 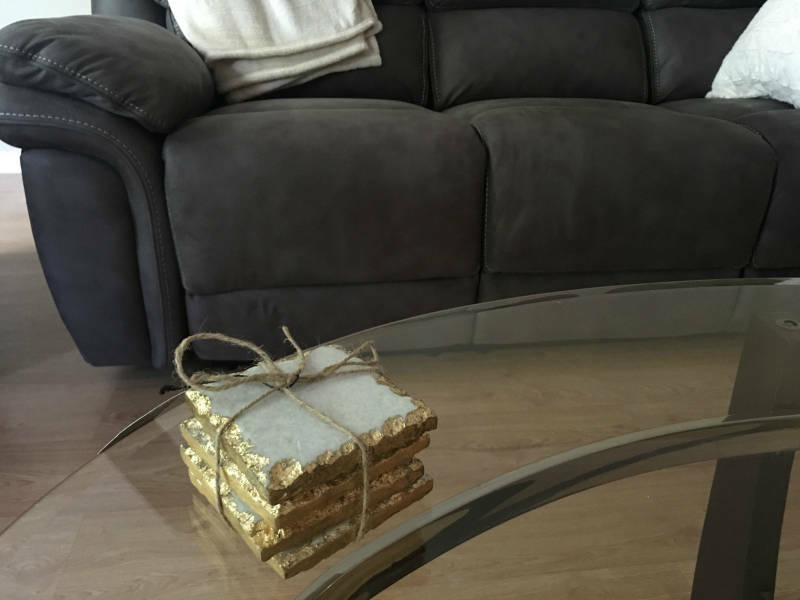 I also picked up the prettiest white marble coasters over the weekend for only $7 from HomeGoods (what a steal)! These will probably only work for warm drinks, as the marble won’t absorb the sweat from cold drinks… but they were too pretty to pass up. I also bought a stack of more practical wooden+cork coasters for cold drinks. I got a few other things from HomeGoods that I’ll have to show you soon, but mostly we’re still on the hunt for nice decor. If you have any special home decor sites that you love to shop from please leave me a link in the comments below! Did you find any good deals over the weekend? Are you almost done with holiday shopping or just getting started? I really like west elm for home decor. They had lacquer trays on sale over the weekend that were really pretty! World Market is another fav although they are hit or miss sometimes. Glad your home is coming along! Your decorations looks great! Does that nail polish really dry right away? And does it stay on for awhile? I need to find a good nail polish to use myself because manicures get too expensive! I love the office decorations! Very pretty polish! I bite my nails so I never polish mine. I would love to have nails… but I guess I don’t want it bad enough because I suppose I could stop biting mine if I wanted to! Your office looks very festive! All I do is put some green lights up in my classroom. It does look fun. I will snap it to you! Your nails look professional!! I have a hard time painting mine on my own, lol! 2 weeks, that is going to be here in no time. That snowman is awesome, I don’t decorate my desk but enjoy decorating the house for Xmas. On Friday I will *start* my Christmas shopping! Well, I guess that is not entirely true because I spend HOURS making a calendar at Shutterfly for my Mom each year and I just finished that. Yahoo!! So now I just need to figure out what to buy the rest of the population…. I know what you mean about nail polish. It’s quite a time commitment! Those coasters are super cute! Love reading about your home makeover. I went to West Elm tonight and saw these awesome coasters (looked like cuts of rock) but they were $59…..no thank you. I think yours looks better. Your snowman is cute! I have a very small one in my office. I think five is a lot of running for all the other things you have going on! That is great you can knock it out. Hopefully you will find something to help your calf muscles soon.